It seems that today there is a lot of panic in the air. There are serious concerns about what is happening in Japan and what potentially may happen if things get worse with the nuclear power plant located in the Fukushima prefecture. The impact of this event has been overwhelming to say the least. The eyes of every nuclear active nation is watching the Japanese with extreme scrutiny. Expert opinions continue to pile up, throwing the situation into an issue of neglect and government and corporate conspiracy. I am not even going to touch that! All I know is the information I receive from trusted news media sources. These sources are Japanese in origin, because obviously the problem itself has the most impact on the Japanese. The Japanese have the most to lose out of all this. I find it surprising that so many nations seem to be up in arms about an issue that ,to be honest, has very little direct impact on them. So as I have spent time gathering information and educating myself on nuclear power and radiation I have come across a lot of interesting facts. Just finding out that there are different types of radiation and different bodily responses was extremely educating. Iodine-131, Caesium-137 are the two waste elements that are problematic at the moment. Iodine is water soluble and has contaminated water sources, and is potentially harmful if it is ingested. It has a half life of 8 days, so it does not stay radioactive very long. If properly avoided it will not cause harm. Caesium acts more like the alkaline elements we are familiar with like potassium, magnesium, etc. It is not fully absorbed by the human body but is mostly excreted, if ingested. However, Caesium stays around for a long time in the environment potentially creating harm over a lifetime of exposure. People love to compare Fukushima to Chernobyl when in reality they are two completely different scenarios. It is like comparing apples and oranges! or a better analogy Tigers and Lions! From the very beginning Chernobyl was man caused while Fukushima`s damage was the result of the biggest earthquake in Japanese history! There are dozen more differences in the nature of the problem of radiation as well the structure of the systems and buildings involved, but I will not attempt to address them....frankly because I don`t want to be writing this blog post all night. The main issue I want to address is the one on everyone`s minds, RADIATION. First of all, the mere thought of being killed by something you can`t see, taste, smell, or feel is scary enough, so it is understandable why people can become panicked so easily. This might "shock" and educate you but radiation occurs NATURALLY. Yes! From weather, rocks, food, trees, radiation exposure happens to us everyday. So the next thought is .... "So what is so bad about this radiation?" Well the radiation that is being emitted from Fukushima is mostly derived from radioactive waste materials as a result of the fission process that is trying to being kept under control at the moment. This was taken from a site that gives the daily readings of radiation. 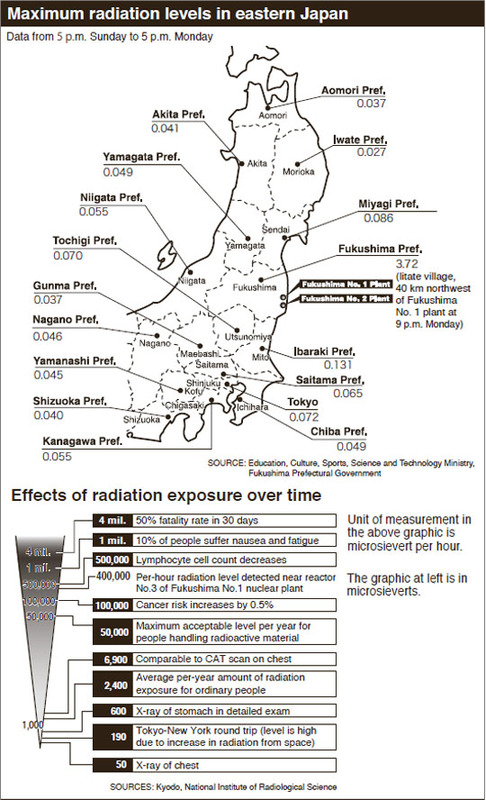 The number assigned to prefecture is emitted per hour. And keep in mind that the number is the MAXIMUM (therefore it could be less). If I calculate my maximum exposure (Chiba) I have about the amount of one chest X ray after about 6 weeks. After about 6 months I might reach the amount of a flight to New York, which by the way business travelers do care free several times a year. To even raise the risk of getting cancer 2% I would have to be exposed for over 50 years!! 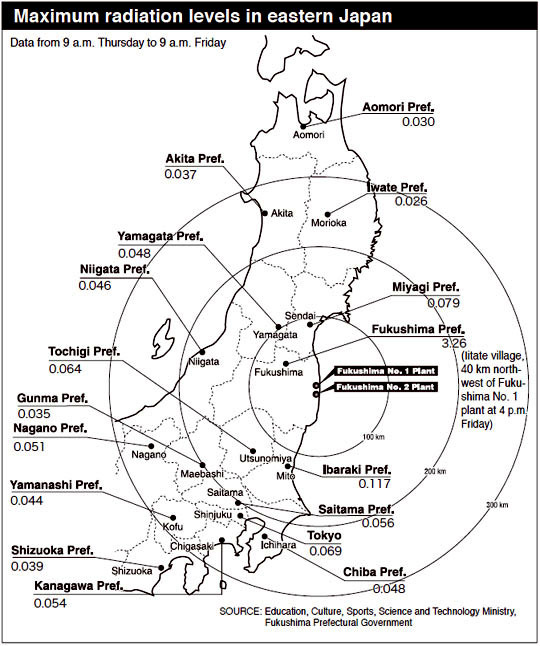 Now the number within the Fukushima prefecture is a lot more concerning but outside the quarantine area the number is still far from bodily harm to people. You are better off watching what you eat and exercising regularly to ward off cancer than worrying about radiation even in Fukushima! Most people are worried about radiation compiling, and that is true, it will compile, but there are ways to reduce your exposure to radiation through daily living. However, the situation is still unpredictable and could potentially get worse, but chances are that it won`t at this point. So Japan is stuck with a problem that could linger for years, stigmatizing the area. The reality is that there could be more deaths caused from the "economic fallout" rather than from radiation. Some people have committed suicide because they have lost all hope of returning to a normal life, or are afraid they cannot make a living anymore. The FEAR of radiation may be more damaging than the actual radiation itself. So rather than panic get the facts, get educated, understand the risks, and look at what people are saying on both sides of the issue. I think taking time to look at the issue from those who work with it everyday will help ground fears most of all. So be mindful of what you do and the impact the environment has on you, and put your fears at rest, more people will die from cancer related to smoking and diet than from radiation exposure and that is a fact! excellent post - thank you for doing your research and presenting this in a calm and thoughtful manner. there is far too much sensationalism going around. That is a shame to hear about your situation. 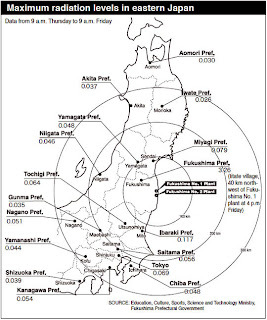 I am certainly not a proponent of nuclear power, but as far as Fukushima the information about the amount of radiation is different. According to sources here only %10 of the Chernobyl amount. Since I have children I am extra careful about the water they drink and other possible ways I131 might contaminate them. Even now people in Japan with children are being extremely careful. The victims of Chernobyl, many had no idea what was going on or what they could do to prevent harm. I agree that there we must get the facts, get educated, understand the risks, and look at what people are saying, before we get panic. More people are dieing from cancer caused by smoking than from radiation exposure. Finally some definitive information about Japan. Excellent post. Thanks for providing facts. It's appreciated.